Hello, beautiful people! I am trying to make this post as quick (I know thats impossible lol) as possible because I have a paper and presentation due tomorrow; but after tomorrow, I officially have one day of school left as a graduate student. I am beyond excited. I bet you guys are already tired from hearing so much about my school stories, but that's pretty much all I have going on at this point. After spending most of my Saturday at the library, I went for the youth/singles' program at my church. I needed a getaway from books and anything related to Financial strategies. At the program, I had this heart warming experience when I was approached by these two lovely ladies who were fans of my blog. I was flattered and overwhelmed with their compliments and how inspired they were. Also during the program, we had to introduce ourselves to someone new that we had never met; so I went to introduce myself to a young lady by the name Tope. During our conversation I found out she also knew about my blog, which was nice. She seemed like a lovely girl and we sat through the program enjoying the drama and music, which was fun. PS: Thanks you to all 2000+ followers here and 1000+ Facebook likes here. I can't really believe that 2000+ people support & love what I do--this little oh girl who grew up in Nigeria; who has loved fashion ever since she was 5 years, but never knew she will have a platform to share and express her love and passion. 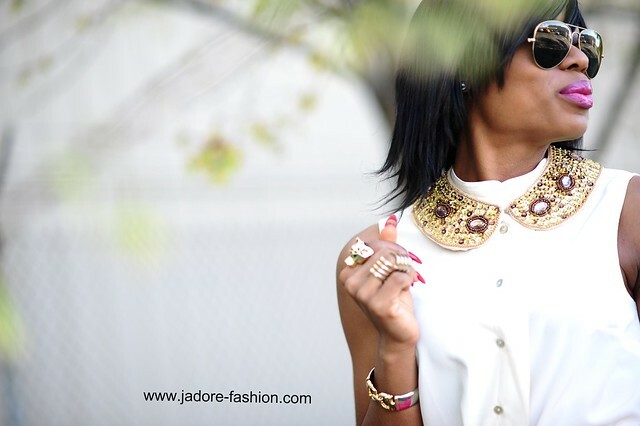 I am deeply touched, THANK YOU all for choosing Jadore-Fashion. What a beatiful dress and I love your necklace. Wow that's a great outfit! love the colour of the skirt and how you've paired it with leopard print heels!! beautiful outfit, the collar reminds me of the collection i'm working on. you look absolutely fabulous! I love your outfit, that bag is soooo gorgeous! Beautiful as ALWAYS Stella!!! And Congratulations on bring Grad School to a close. I remember my last days, I was sooooooooooo glad when they were over! How cool is it that you got to meet people who read your blog! And congrats on almost graduating! That will be such an accomplishment! And you are looking so fabulous in this bright maxi. How do you do all of this and look so pretty? I remember being in college. Ugh. Exhausting! Hats off to you girl! awwww, we really do love your blog. Nice outfit! Congratulations on your awesome accomplishment! I wish you much success in whatever you wish to accomplish. I <3 your leopard print heels. pretty! wanna follow each other? love how casual n chic it looks at the same time..
congrats on ur last day of school! keeo it happen ,u inspire me a loooooooooot!! 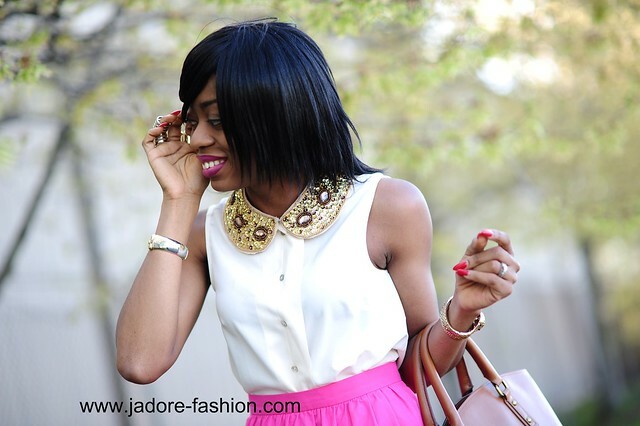 I love embellished collar! It is always beautiful! You look fantastic! Brava! The skirt and your complete outfit looks so fabulous! Congrats for the success of your great blog, I love every single one of your posts! That collar is stunning, girl! Wow! i love this outfit! awesome! shirt&pink skirt&shoes everything is perfect. u look gorgeous! Congrats dear, you are amazing!! 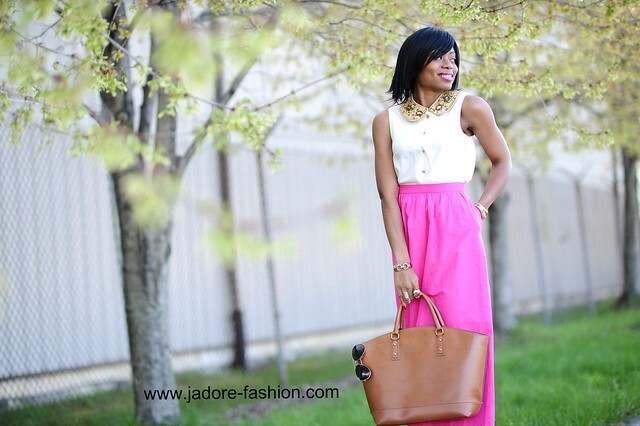 Love love love this pink long skirt, looks perfect! Your necklace makes me crazy, so elegant and classy! All your hard work will pay off. I love the pink. that bag........ oh that bag. Loved it for ages. I simply need to get a collar like your! It is gorgeous! And it looks sooo elegant! Congrats,hon!I wish you all the best!Great look,as always! I love your skirt, fabulous. Great combination with the Leopard Shoes! Congratulations on completing grad school. I just finished my last class for grad school last Thursday so I know the feeling of happiness that comes with such a formidable accomplishment. Best wishes on your future successes. P.S. Your outfit is FANTASTIC! Wow, dress and shoes are amazing! Love the Blog... so u deserve plenty more followers. Congrats! 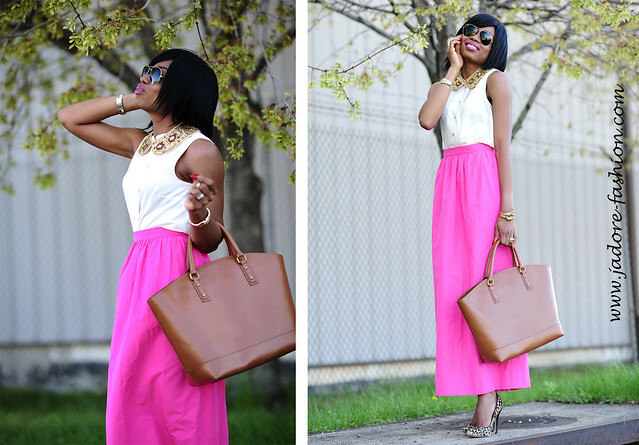 You know me and my love affair with pink so this pink maxi is all right with me :) LOVE LOVE LOVE it! This skirt looks gorgeous on you and I love how you paired it with those amazing leopard pumps! I truly need to purchase some like these! I first noticed the leo shoes....total sucker for leopard print. Such a cute skirt Stella, the pink is perfect on you! 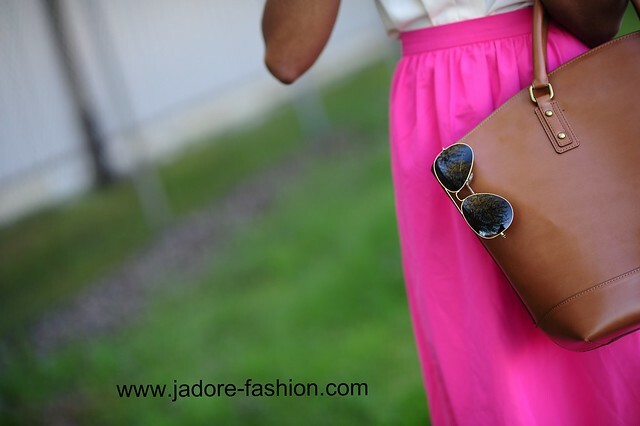 Love this J.Crew skirt, the color is magnificent and you look great. btw..would you like to follow each other? You look stunning! I love the color of that skirt and it looks phenomenal with your shoes. You look amazing and you are also funny about that last part! You are an inspiration to alot of people and am so glad to come by your blog this few weeks! Congratulations on your 1000 and 2000 numbers, great work! The color are very lovely and i can say its adorable from accessories to clothing excellent. Hi just saw your blog and was surprised to see a student keep up such quality of blogging and yes the fashion. Must congratulate you for your efforts. And wish all the success. You end your school, so may be I could expect more fashion articles. Please keep it going. WOWWW! I love that skirt!! And the collar necklace is to die for! Yep....that skirt is definitely eye catching. It was the first thing my eyes laid on. I love the color too! That pink skirt looks great on you!! Great style! 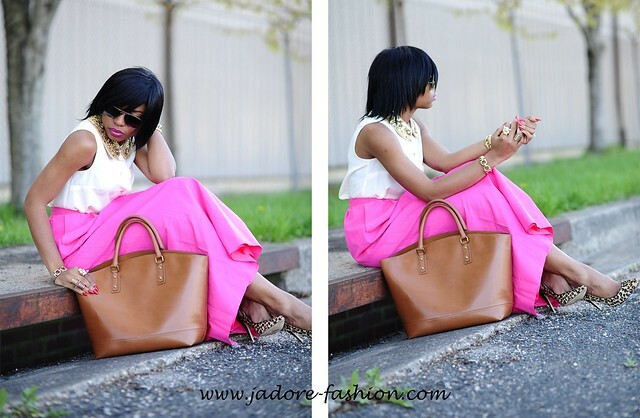 i love love the color of the skirt, the pop of color is amazing. Thank you for the comment on my blog! I absolutely love yours, no hint of a lie! Your style is effortless, and your inspiration is beyond beautiful. Keep up the amazing work, congrats on all your followers!!! Firstly, congratulations on 2000+ readers, that's amazing! You totally deserve it, you put so much work into your outfits and posts. They are always joyful to read. Good luck with your graduation and all that. p.s loving this outfit so much! Such a great skirt! Thank you for the blog comment. And good luck on the last week of school for you! I am working on finals studying as well. i love ur shoes and your maxi skirt is sp beautiful!! love the outfit! love this look. that collar is impeccable!